Under the Regulatory Reform Fire Safety order, premises are required to be fitted with suitable fire fighting equipment and portable fire extinguishers can provide an integral part of fire safety equipment. Fire extinguishers should be serviced by a competent person (at least annually) and they should also have regular visual inspections conducted. In between the annual service, the responsible person (or nominated representative) should ensure that a visual inspection of fire extinguishers is undertaken. The visual inspection should take place at least quarterly, but preferably monthly. 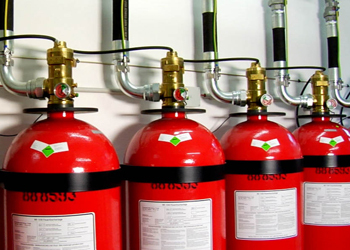 What is annual fire extinguisher servicing? An annual ‘basic’ service should be carried out each year by a competent person. A competent person is a person who has the necessary training, qualifications and experience to undertake fire extinguisher servicing as well as possessing the necessary tools, equipment and information to carry out maintenance procedures. The basic service will usually involve checking all parts including tubes, gauges, safety devices and operating mechanisms to ensure that the extinguisher is safe and in good working order at the time of service. The Engineer will sign the service label to show that a service has been carried out. Under the Regulatory Reform (Fire Safety) Order 2005, the ‘responsible person’ has a duty to ensure that appropriate fire fighting is provided and maintained. The responsible person can be a building or business owner, tenant or landlord. The Regulatory Reform (Fire Safety) Order 2005 applies to ALL non-domestic properties in England and Wales. The responsible person should ensure that all fire extinguishers that are provided in non-domestic premises including offices, warehouses etc. are installed and maintained by a competent person in line with British Standards. 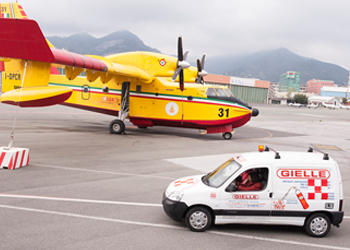 Here at Gielle, we supply a cost effective solution for the purchase of new fire extinguishers and other portable fire fighting equipment and ancillary goods. We do not undertake the installation or servicing of equipment. It is recommended that all businesses employ the services of a reputable fire protection company to ensure that extinguisher and equipment are installed and maintained in line with the relevant British Standards. Fire extinguishers should be commissioned and checked by a competent person (e.g. trained fire engineer) before they are installed. The initial service will include an Engineer checking that the extinguisher is in working order and checking the pressure and weight of the extinguisher. The Engineer will certify the extinguisher and will attached a service label. The servicing standard BS 5306 Part 3 puts the onus on the user to employ a competent person and to ensure that extinguishers are installed and serviced to this Standard. An annual ‘basic’ service should be carried out each year by a competent person. The basic service will usually involve checking all parts including tubes, gauges, safety devices and operating mechanisms to ensure that the extinguisher is safe and in good working order at the time of service. The Engineer will sign the service label to show that a service has been carried out. 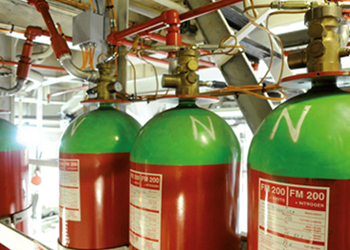 Every ten years, carbon dioxide extinguishers require hydraulic testing where the extinguisher will be removed from site and overhauled.